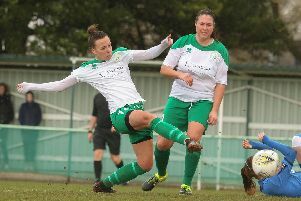 Jade Brook’s brace was enough to push Chichester City off the top spot in a 2-1 defeat to Coventry at Oaklands Park in the FA Women’s National League Southern Premier. There were two quick goals in the first-half with Brook scoring the opener before Cherelle Khassal made it honours even two minutes later. The two sides cancelled each other out in the physical battles but Brook found the winner with a lobbed effort. It was first v second at Oaklands Park with neither side having lost a game in the first four league fixtures. City boss Aaron Smith made two changes to the team that had beaten Pompey on Thursday night, as Helen Ogle and Jade Widdows started. There were chances in the opening stages for both sides, Khassal and Chloe Melton putting their efforts wide and Marie Gauntlett seeing one sail over the goal. The visitors took the lead in the eighth minute from a free-kick that sailed towards the back post, where Brook was able to get a touch that Lauren Dolbear was unlucky not to parry. The lead didn’t last long as Widdows broke into the box and set up Khassal for a lovely back-flick goal. Both sides looked lively and Chichester had a series of chances with Tiffany Taylor and Widdows unlucky not to score from headers. Dolbear was called into action, parrying a volleyed effort from a Coventry corner. Widdows missed another header before Hollie Wride smashed the ball at goal forcing Susan Wood into a fingertip save. The game was end to end, meaning both defences needed to be alert, and Taylor forced a Coventry shot into the side netting. Deep into first half injury time Chi nearly found a goal to put them ahead at the break through Khassal but Wood and her defender do enough to block and smother. Into the second half, Coventry looked the brighter although Clark struck a lovely shot only to see it claimed by Wood. Dolbear was kept busy and had to claim several Coventry crosses. Dolbear made a great save from a shot on the edge of the area before Gauntlett dragged a shot wide. Coventry’s pressure told in the end as Brook raced through on goal and lobbed the ball over Dolbear for her second of the afternoon. Chi searched for an equaliser but no one got on the end a great Clark free-kick - before Stephens saw her shot graze the post. The game was scrappy at times and saw a number of fouls, free-kicks and yellow cards as Chi continued to search - in vain - for an equaliser. * Up next for Chichester is another home match against Cardiff City next Sunday, September 23rd.